Dining in Macau is an interesting experience as traditional Chinese flavors are infused with the Portuguese influence to create a wide range of dishes that cannot be found anywhere else in the world. Whether you call it the Vegas of the East, or the Monte Carlo of the Orient, there's little doubt that Macau’s high rise casinos and neon-bathed entertainment complexes are carving out a world-class reputation of their own. Dramatic hotel-casinos light up the night’s sky with a kaleidoscope of colours, so get out there and let Macau’s clubs, bars and acrobatic entertainment options leave your head in a spin. Don’t go thinking Macau's just an adult's playground - bring the kids along, and make the most of this city’s elaborately themed hotels and enchanting attractions. 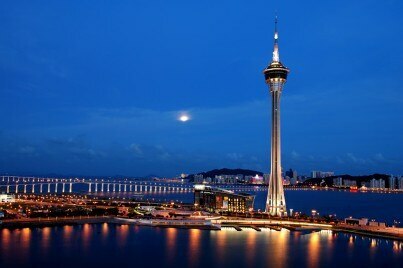 With Hong Kong’s skyscrapered dreamland also within tantalisingly easy reach, Macau is perfect for a family seeking urban adventures. Macau’s casinos may hog the spotlight, but if you need a break from the glitz and the glamour, you’ll find no shortage of cultural wonders in Macau. From ornate temples sparkling with gold to museums that bring this strategically significant peninsula’s past to life, you’ll feel like you’ve hit the jackpot as you dive a little deeper into Macau. Asian casinos are giving Vegas a run for its money, with locations like Macau and Singapore overtaking the traditional gambling mecca in the visitor stakes. Why not try your own hand in one of these eastern casinos and see if Lady Luck shines on you?